Hurricane Harvey was an extremely destructive Atlantic hurricane which hit Texas in August 2017. With wind speeds of up to 215 km/hr, many areas received more than 40 inches (100 cm) of rain, causing catastrophic flooding. With peak accumulations of 64.58 in (164.0 cm), Harvey was the wettest tropical cyclone on record in the United States. The resulting floods inundated hundreds of thousands of homes, displaced more than 30,000 people, and prompted more than 17,000 rescues. This in-depth record penned by Renee Knight of insideunmannedsystems.com documents how drones helped to reduce suffering and accelerate the restoration of services, in spite of emergency services not really understanding how they could help. Drone operator Dallas Griffin lives just north of Beaumont, Texas, one of the many areas in the Lone Star state hit hard by Hurricane Harvey. While the flood waters didn’t reach his home, that wasn’t the case for many members of his community—which is why he decided to fly his unmanned aircraft system (UAS) to help in any way he could. 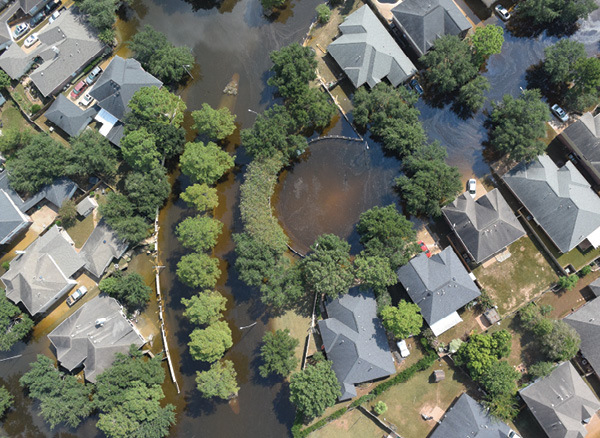 The county’s drone operator was stuck in Houston when Harvey hit Beaumont and the surrounding areas, so Griffin stepped up, providing emergency management services personnel with aerial imagery to help them determine where resources were needed most. He flew his DJI Inspire 1 over highways as the waters receded, looking for damaged bridges and washed out roadways. The imagery revealed a level of damage well beyond what officials were expecting. Having access to this information so quickly allowed them to better coordinate with the state, Griffin said, and get manpower out to the most damaged areas as fast as possible. Griffin is among many UAS operators who either volunteered their time or worked as part of a company drone program after Hurricanes Harvey and Irma. Mapping flooded and wind-damaged areas, gathering imagery for the media, collecting information for insurance claims, and inspecting power lines, cell towers and railways represent the many ways drones were used in the aftermath of these disasters. While this certainly wasn’t the first time UAS were deployed after a hurricane, it was the first time they were used on such a large scale. All operators worked closely with the Federal Aviation Administration (FAA) to obtain authorization to deploy in areas with temporary flight restrictions (TFRs), and coordinated with emergency responders and other officials to ensure they flew safely, never getting in the way of manned aircraft who were performing rescue operations or other important missions. In many instances, UAS made it possible to access areas that otherwise wouldn’t have been reachable for days—helping to get services back online faster as well as speed up the long recovery process. At least two UAS groups from within the state poolled their resources to help after Harvey hit: Lone Star UAS Center of Excellence and Innovation at Texas A&M University–Corpus Christi and the Public Safety UAS Response Team out of Johnson County, Texas, which is near Dallas. Jerry Hendrix, executive director of the Center of Excellence (COE), spent two weeks in the hardest-hit areas. Hendrix and his team started at the Port of Corpus Christi. They helped secure the necessary permissions to fly in the restricted airspace, over people and beyond visual line of site (BVLOS) over 25 miles of the ship channel. The port wasn’t open to shipping and commerce, and the goal of the flights was to identify any hazards that would make opening the port unsafe. The flights revealed previously unknown damage to some of the buildings and a sunken boat in one of the channels that no one had reported. The Lone Star team also worked with other organizations in Fort Bend County and with Dr. Robin Murphy and her Roboticists Without Borders group, which is part of The Center for Robot-Assisted Search and Rescue (CRASAR) at Texas A&M University. They surveyed dams, levees, roadways and assessed the continuing rise of water in that area, Hendrix said. From there they went on to survey Rockport, Holiday Beach and Port Aransas, and flew a variety of UAS equipped with different sensors to capture the devastation. The photos collected were anchored to Google Satellite imagery so officials could compare and determine exactly how much damage houses in the area had sustained. The UAS were equipped with LiDAR during some assessment flights, so county officials could use 3-D models built from the point cloud to survey both sides of a home. The data they collected helped determine the percentage of damage in each community, house by house, and that percentage was used to calculate the total damage in the county—enabling them to gain more federal aid, Hendrix said. One of the COE’s other main roles was to educate local officials about the importance of putting up TFRs, Hendrix said. A lot of people would come to hard-hit areas, UAS in hand, wanting to help, but many of these well-intentioned pilots just didn’t have the necessary experience and would only get in the way. It was important that the only people flying had permission from the FAA and were coordinating with manned aviation. Jamie Moore, Johnson County’s emergency management coordinator and head of the Public Safety UAS Response Team, was ready to deploy pretty quickly after Harvey made landfall, but had to wait a few days before he could make the trip. The team initially thought they would get a state deployment, but that pipeline was backlogged and it never happened. Eventually, Missouri City sent a request to the team for their services. Once Moore’s group arrived, they began flying UAS to evaluate levees. Officials wanted to make sure the levees were holding and that unreachable pumps were still functional. 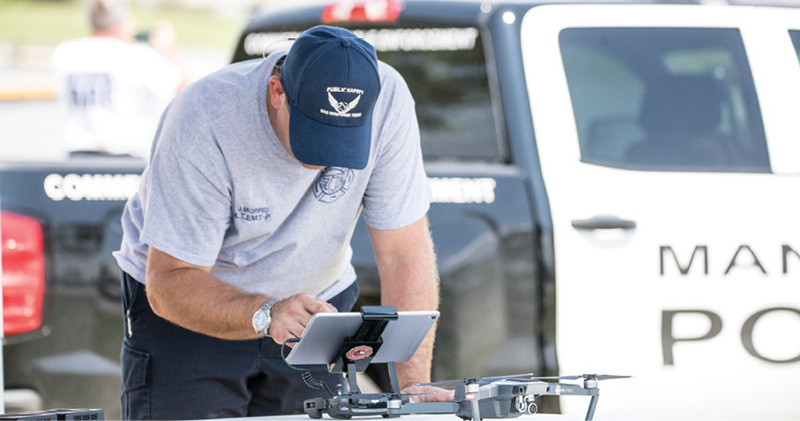 Officials in Missouri City didn’t have much experience with UAS, so Moore spent time educating them about what the technology could do and how they could best use the assets, from high-resolution detailed maps to volume calculations. The most frustrating part of the process was getting the initial permission to fly in another jurisdiction’s airspace. The group’s blanket COA covers flights when there’s an emergency in Johnson County, but nowhere else. Had they gotten there sooner, they might have been able to help more with search and rescue operations, delivering water and other supplies to citizens stranded on their roofs. That said, after getting the initial permissions, the process became much easier. All they needed to do was call or email the state operations center, give their GPS coordinates and any other pertinent flight-related information, and the person in charge of UAS operations for the state would grant them the necessary permission. They’d complete the flight then move on to the next one. The drone operators who gave their time weren’t limited to those who lived in the area. Volunteers traveled from as far as New York, South Carolina, Washington and other parts of the country to help. Parker Gyokeres, owner of Propellerheads Aerial Photography, drove from New York to Texas to offer his services, and even assembled a team of other highly skilled drone operators to join him. He’d met some of them in person before and knew the rest through social media and online forums. After about 10 days of sharing an RV and performing countless missions, these men formed a bond, becoming a family of sorts that shared what Gyokeres described as a once in a lifetime experience. At first, the team planned to fly missions in Houston for the Red Cross, Gyokeres said, but when that fell through, they moved on to Port Arthur and then Rockport. The officials in Port Arthur wanted to know what areas of the town were flooded and which ones were not. They flew the entire town in an hour and a half, and provided officials with a map that showed them exactly which areas were accessible and which weren’t, giving them complete situational awareness. Once they moved on to Rockport, about a week after the storm hit and the roads were cleared, Gyokeres and his team connected with the town’s former mayor and current Aransas County judge, who happened to know Gyokeres’s father. He introduced them to Michael Soto, chief appraiser for Aransas County, who wanted to know just how much damage they were dealing with in the worst hit areas. A manned aircraft had taken images right after the storm, but they were only at a 10 to 15 cm pixel resolution. While that’s higher quality than Google Earth, it just didn’t offer the detail Soto needed. Gyokeres and his team documented 650 houses in Key Allegro in about three hours, and completed flights over a total of 1,650 houses in three days. Typically, Soto would have to drive street by street to collect this kind of information, Soto said, a process that takes two to three weeks. The video the DJI drones collected, mostly using the Phantom 4 Pro, gave them a sense of the damage to a particular area, while the still imagery enabled them to better see site specific damage—supporting, clarifying or correcting information they received from other sources. Brian Scott, owner of Upstate Aerial, served as the air liaison for the team, and coordinated with the FAA as well as emergency operation centers to plan the various flights. The team was granted multiple authorizations a day, with the FAA doing their part to speed along the process so these and other pilots could safely fly their missions. Scott spent a lot of time emailing and talking with the FAA, but once he established a relationship with the main contact and it became clear the volunteers knew what they were doing, the FAA would review their request and quickly grant them permission to fly. Media outlets such as USA Today and ABC had drones in the air after the hurricanes to capture footage for their audiences. Brian Emfinger, a storm chaser who works for KATV Channel 7 in Little Rock, Arkansas, traveled to Texas and Florida to take drone video for the station. He also flew freelance missions with his personal drone for Live Storms Media, a company that sells storm footage to media outlets. His employer, Sinclair Broadcast Group (SBG), has strict guidelines about how drones can be used, especially in severe weather, so much of the storm-related footage was captured for LSM. Emfinger has flown in hurricanes before, and knew the FAA would likely issue a TFR pretty quickly after Harvey made landfall. As with most storms he’s covered, Emfinger was one of the first media personnel on the scene, flying in Rockport the morning after the hurricane hit. There weren’t any aircraft in the area yet, it was still pretty windy and rainy, so he didn’t have to worry about avoiding other UAS and manned aircraft, and there were no concerns about flying over people. Once he collected the imagery, he had to drive inland 20 or 30 miles to get the video out, because there was no cell service in the area. After Rockport, Emfinger went home for a few days, then came back to cover the flooding in Beaumont and other hurricane-related stories in Houston. Before he left the state, he took some aerial footage for his freelance work, capturing images of the piles of debris that sat outside people’s flooded homes. Again he headed back to Arkansas, and a few days later was on his way to Florida to cover the next big storm, Irma. During Irma, Emfinger was able to fly his drone within the eye of the storm, near Naples. Unlike when Harvey made landfall, it was light out when Irma came ashore, so he could see it coming in. The winds, at more than 100 mph, were pretty intense, and did significant damage to a mobile home park he was near. 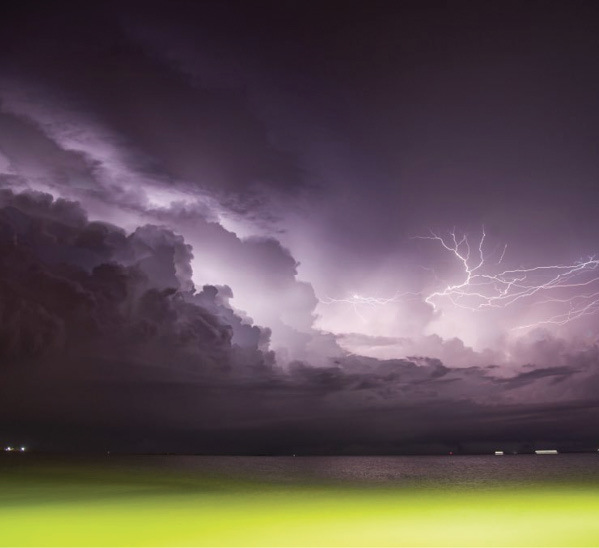 He captured footage there before driving north in the storm, staying in the eye to avoid the worst of the weather. Over the years, Emfinger has learned plenty of tricks to keep his drones safe when flying in severe weather conditions. He flew the Mavic from DJI in both Harvey and Irma, and said when the bubble protector is placed on the camera and the gimbal, the drone becomes surprisingly water resistant. He’s flown during tropical storm conditions, and knows how to maneuver the drone to keep it up, and what he can and can’t get away with. If it’s raining too hard, he’ll put the drone straight up as a sky cam rather than flying it around, and he’ll limit the amount of time it spends in the air. He keeps a close eye on the weather, and if he notices a heavy band of rain is coming in, he’ll ground the drone until the weather lets up. To help keep the UAS dry, he wipes it off with paper towels, and leaves the system on so it has internal heat. When he’s driving to his next location, he puts the drone on the dash, exposing it to more heat. Emfinger knows the images he’s collecting aren’t only important for the media outlets who can use them; they also give citizens and officials information they need about what’s happening with the storm, and how it’s affecting their communities. Butch Stephens, a teacher and owner of So Fly Video Productions, doesn’t typically capture footage for the media but was able to do so during Harvey. His house wasn’t flooded, but Stephens and the rest of his neighbors couldn’t leave for a few days. When the weather broke, he grabbed his Inspire 1 and started flying the area to get a feel for just how bad the flooding was. Once he was able to leave his neighborhood, he took more footage and uploaded it to Stringer, a platform where news organizations can download video taken by freelancers. His videos were downloaded about 10 times, and were used by local media to show their viewers the devastation. Fox Sports used some of the footage for a segment they did on J.J. Watt and the money he raised for the hurricane, and there’s also plans for it to be used in an episode of The Little Couple, a TLC show based in Houston. The benefits to flying UAS after hurricanes like Harvey and Irma are many, but of course so are the challenges. There’s not only harsh weather conditions to deal with, keeping systems grounded or at least extremely limited, there’s navigating TFRs, finding ways to keep batteries charged, avoiding manned aircraft that are part of the recovery efforts, remaining self-sufficient in areas with limited resources, effectively working with local officials and interacting with community members who have just lost their homes and may not understand why drones are being flown in their area. Pilots have to be prepared to handle the harsh conditions, and also to deal with the devastation and despair that surrounds them. It was a bit of an emotional roller coaster for many of the UAS operators, but most community members and officials were appreciative of their efforts. Swarms of large mosquitos were a constant menace for Gyokeres and his team, and the logistics to operating the UAS, mostly DJI systems, and finding places for everyone to sleep in the RV proved difficult at times. No matter how frustrating a situation became, however, they knew they had it much better than the people of Texas who were flooded out of their homes. Gyokeres had plenty of stories to share about the communities, and the spirit Texans showed as they dealt with the aftermath of Harvey. One instance in particular sticks out. A church in Rockport that sat on the main road in town, about a mile and a half from shore, was unusable after the storm. The pews were smashed into the back walls, part of the building had been ripped off and what was left of the inside was covered in debris. The church members set up a tent in front of that church to cook food for anyone who needed it. “Is that all you got Harvey?” was written on the side of the door—a common question that Gyokeres saw penciled in near and around many of the destroyed homes in Rockport. 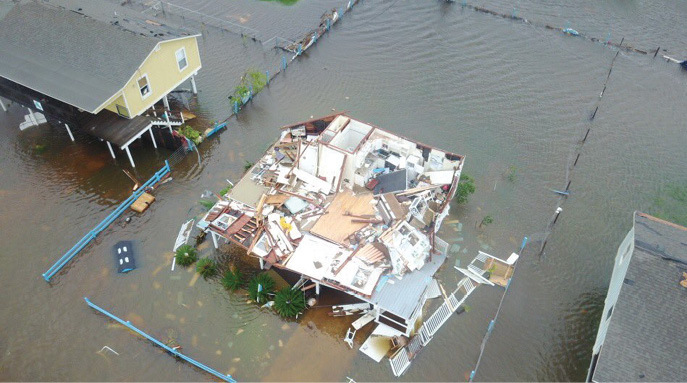 While drones have been used to help hurricane recovery efforts before, these storms represent the first time they were used on such a large scale. That’s mostly because of the timing, Hendrix said. Part 107 has been in effect for a year, opening up the possibilities for drone use, and the technology has reached a level that makes UAS a viable solution for a host of applications. People are more educated and accepting of the systems, though there’s still more that can be done to prepare first responders to take advantage of the technology after storms like Harvey and Irma. Going forward, Hendrix would like to see a little better coordination with the emergency operations centers. The FAA did a great job setting up the necessary layers to quickly get approvals so UAS pilots could fly, but it took some time for first responders to determine where they actually needed help, and to then pass that information on to the drone operators. The personnel in the emergency operations centers are stressed and exhausted, working long hours and making difficult decisions, Hendrix said, and many of them don’t know a lot about UAS and what they can do. Many county judges, who are responsible for asking the state to set up TFRs in Texas, didn’t even really know what a TFR was or why they might need it. Educating first responders about UAS and how to integrate them into emergency response will help with disaster responses in the future, and is something Hendrix and his team plan to focus on. Synchronizing the center’s needs with the capability of the aircraft and the pilots would also make a huge difference. If operators without the right qualifications come to help, officials can tell them they already have someone on the job, reducing the confusion and the number of novices flying in already crowded airspace. Once they have a chance to decompress, operators will look at how the missions went after both Harvey and Irma and take lessons learned into the next disaster response. Those who were part of the recovery efforts are certain drones will continue to play a huge role in these types of missions, with even more applications and benefits to come in the future. Drones also will continue to help the communities impacted by these latest storms as they focus on rebuilding.